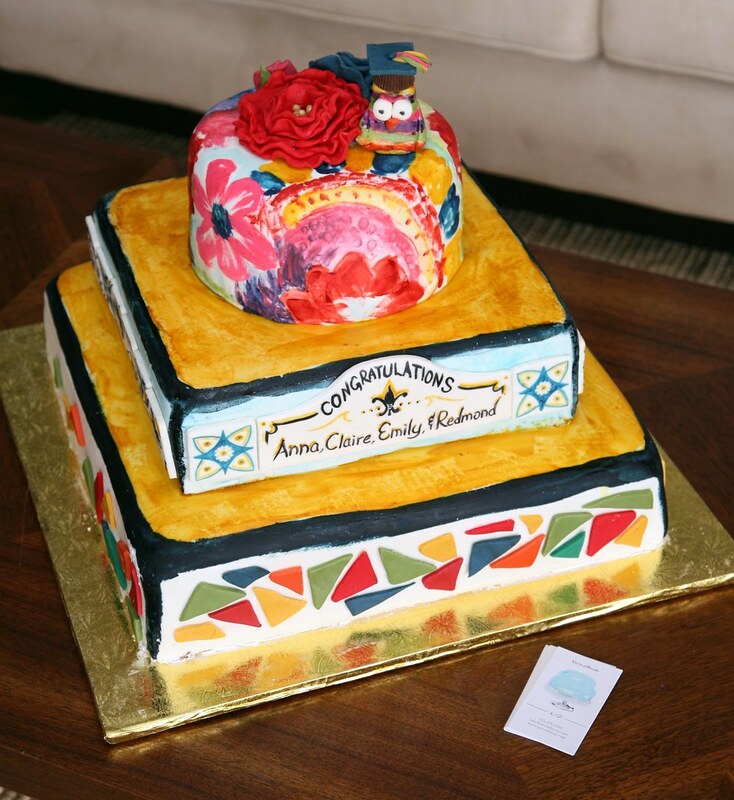 Our neighborhood friends, The Cassidy's, asked me if I would make a cake for a big graduation party they were throwing for their two girls, Emily and Claire, and two of their close friends, Anna and Redmond. Emily and Anna graduated 8th Grade from Saint Philips. Claire and Redmond just graduated from SI and Stuart Hall. Bebe told me they were having a "little" fiesta with about 150 people invited -- and would be serving hispanic foods at the party. There was one specific request from the girls --- they really wanted velvet cake! :) So I made the largest square tier of the cake a Red Velvet Cake with Cream Cheese Frosting. The 2nd square tier was chocolate cake with chocolate frosting and the top round tier was vanilla cake with vanilla frosting. Oh, and Bebe thought it would be nice to put the grads names somewhere on the side of the cake. Agreed! Other than that, they gave me creative license to do what I had to do to make one heck of a centerpiece for a graduation fiesta. I was excited to get to work and my wheels started turning... ...and here is what I thought a Graduation Fiesta Cake should look like! PS - My biggest cake yet!! 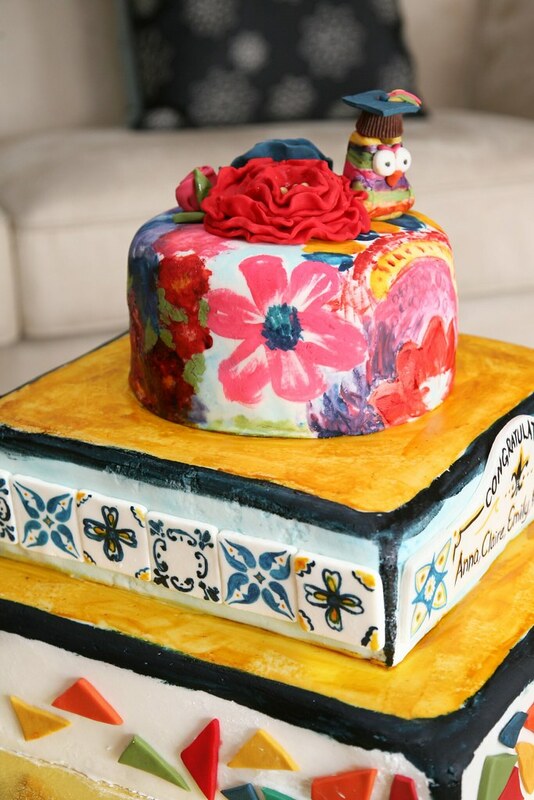 I wanted to incorporate some spanish tiles into the cake design, hand painted onto the fondant, with lots of color and character. 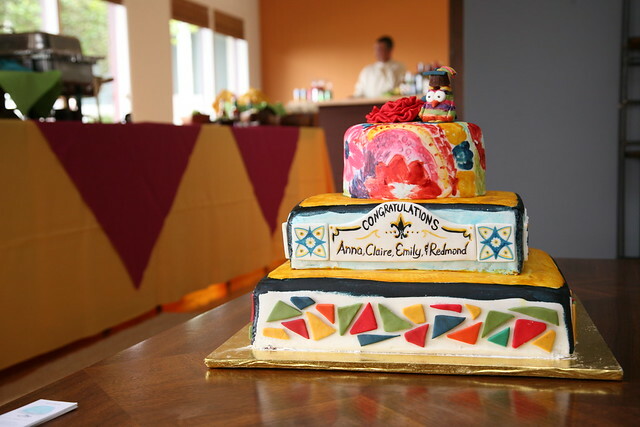 Cole painted a plaque with the graduates names, which went front and center onto the middle tier of cake with a border of square tiles going all around it. 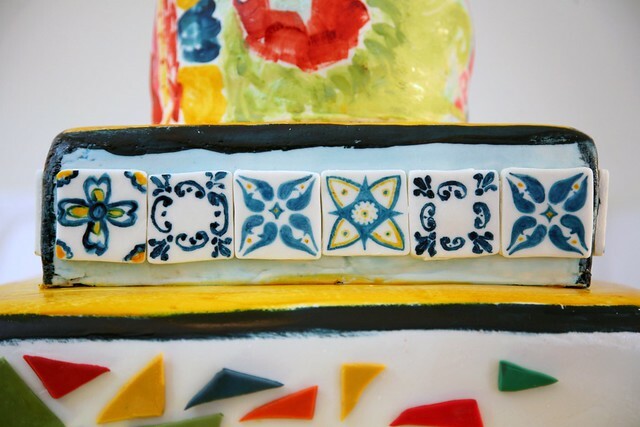 he bottom tier of cake was decorated with some colorful mosaic tiles made out of triangular pieces of fondant. For the top tier of the cake, I got some wonderful color and design inspiration from this amazing Frieda Kahlo painting called "Self Portrait -- The Frame". 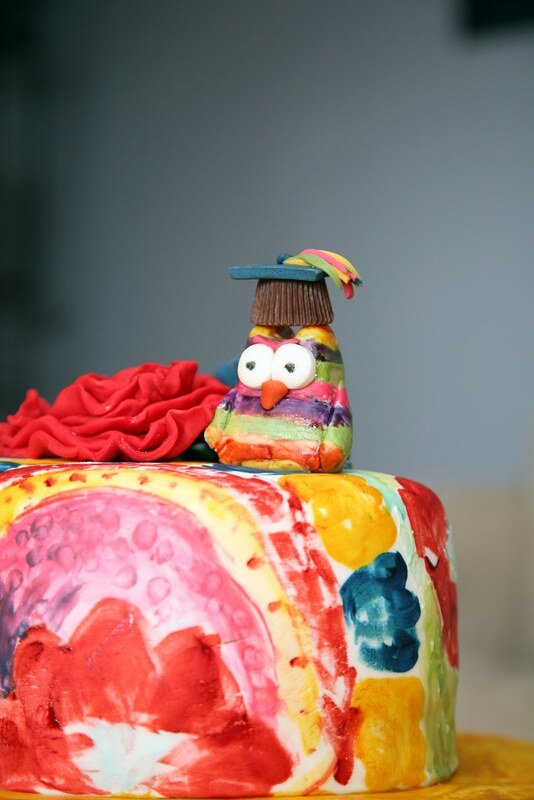 I imitated Mexican Paper Flowers using fondant and put them on top of the cake next to a little wise graduation owl...decorated with colorful stripes just like a piñata. I must say, that was my favorite part of the whole thing... I thought that really brought the whole theme home.